A GW Alternative Breaks group took a trip to Detroit last week, helping with art installations and boarding up houses. When senior Max Chen decided to spend his spring break in Detroit, he imagined a post-apocalyptic city. He spent a week helping to clear out abandoned lots and board up run-down homes with GW’s Alternative Spring Breaks program, but he also saw a city of hopeful people working to lift their city out of its economic collapse. “Meeting people was the best part. People were very passionate about Detroit, they had a lot of Detroit spirit and they really want to improve the community,” Chen said. Students in charge of the spring break program started planning the 20-student trip in November, about four months after the city declared bankruptcy. Media Credit: Photo courtesy of Max Chen. 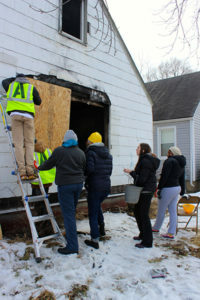 Twenty students went to Detroit as part of the Alternative Spring Breaks program and helped board up abandoned houses. Senior Andie Hession said she and co-leader Ashley Burchell spent the last seven months studying the history and culture of Detroit, partnering with agencies in the city and organizing fundraisers to prepare for the trip. The group boarded up about 20 abandoned houses with a group of Americorps volunteers and helped prepare volunteer housing on an urban farm. 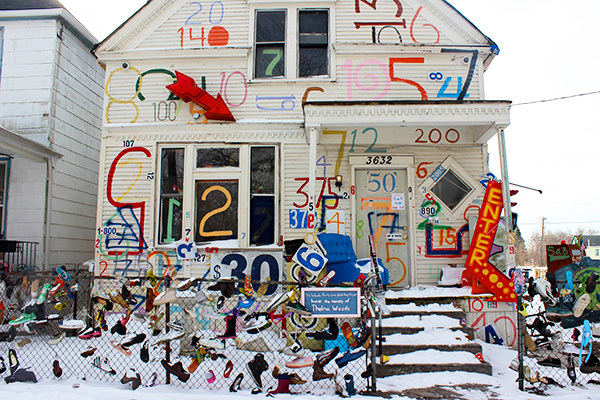 They also helped clear arson sites with the Heidelberg Project, a local art foundation that creates installations out of abandoned houses, covering them in bright paint and offbeat materials like shoes, stuffed animals and children’s toys. But the project’s work has been hit by arson attacks: Nine installations have been set on fire over the last 10 months, and six of the sites have been completely destroyed. Junior Danielle McFadden said she was struck by the power of the project. “People think it’s outlandish and it is, but the more time you spend there the more you see how much of a work of art it is,” she said. She remembers speaking with an artist whose work had been destroyed by arsonists, but who remained positive. “He was standing next to his work that had been burned down, and he was saying that he was glad that it happened because it means that his work was inspiring others to act,” McFadden said. GW’s Alternative Spring Breaks program sent about 230 students on self-funded trips across the country and to Latin America this year, to work on projects ranging from hurricane cleanup in New Orleans to work in homeless shelters for lesbian, gay, bisexual and transgender youth in New York City. Burchell, a junior, said she was impressed by people’s energy and excitement to work with the volunteers. “Even though it is a very forgotten city it still has all these people who really have a lot of pride about their city and want to revitalize it,” Burchell said.